The weather has not been great so work with Albs has been sporadic and all in hand. Today I put out some poles and a couple of jumps and we mixed up our lunge session with a little jumping. 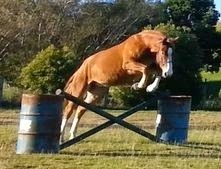 He seems to really enjoy the idea of jumping and seeks out the jumps and locks on to them. I'm sure that when the time comes to jump him under saddle, he will take to it like a duck to water. Of course, as he is only three, there won't be any jumping under saddle for a wee while. Better get the hang of walking, trotting and cantering first anyway! Here is a wee video and a couple of screen shots - I think you'd have to agree that he's pretty damned cute!